JBG rendering of retail building at 18th Street S. and Crystal Drive. 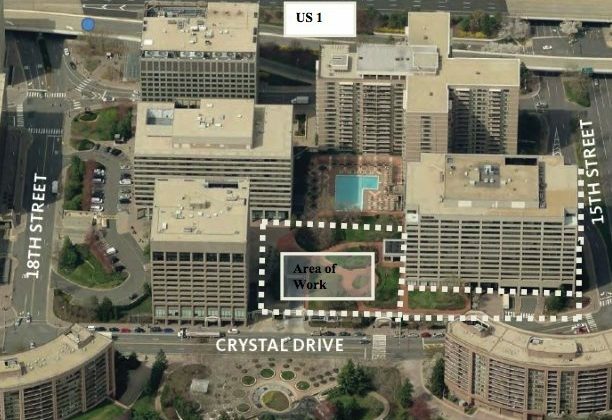 Plans to transform a section of Crystal City into a new retail hub for the neighborhood could soon move ahead, though neighbors and cyclists are still pressing for changes to the redevelopment effort. 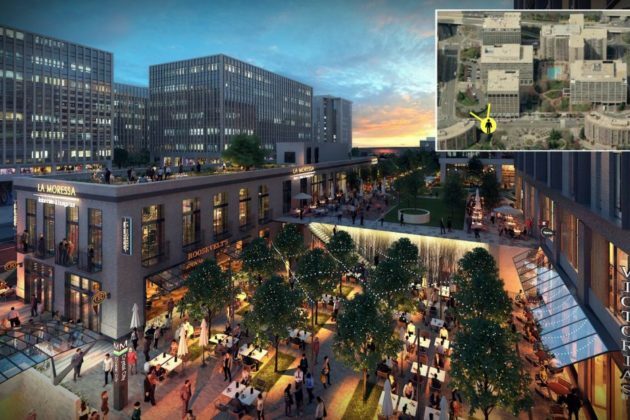 Many of JBG Smith’s plans for the “Crystal Square” project, centered on a block of Crystal Drive between 15th Street S. and 18th Street S., are up for approval by the County Board this weekend. 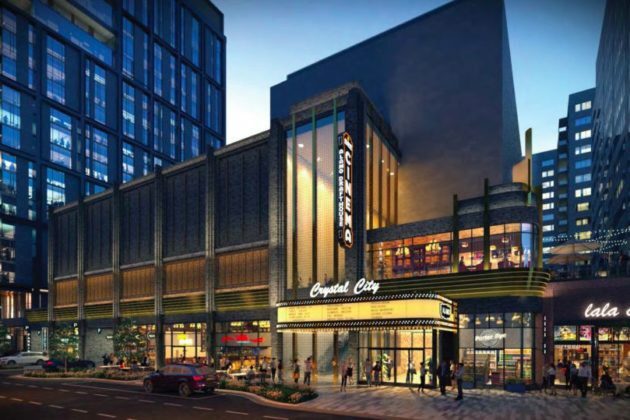 The long-awaited project would completely revamp the existing office buildings on the block, adding a new movie theater, grocery store and other retailers to replace the existing Crystal City Shops at 1750. 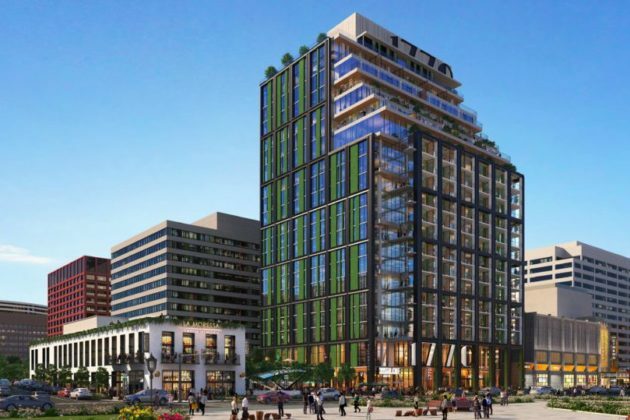 County staff and planners have generally given the project a green light, given its potential to help speed along the transformation of a block centered around the area’s Metro station. 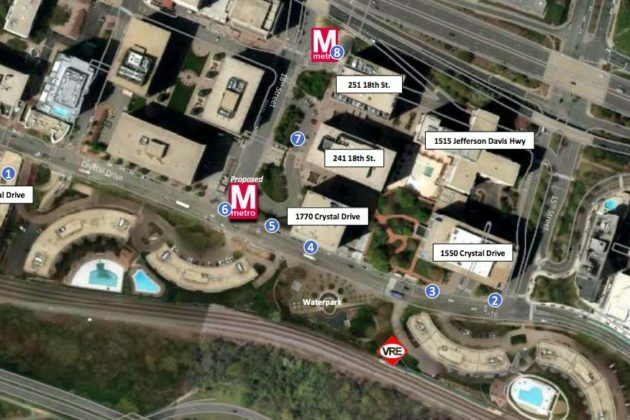 Even still, some people living nearby worry that the construction will blot out some of Crystal City’s limited green space, and won’t address the neighborhood’s transportation challenges. 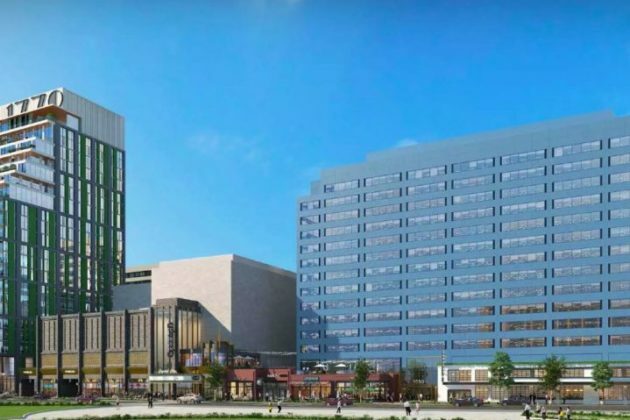 The heart of the Crystal Square development, backed by the area’s largest property owner, generally isn’t up for dispute. 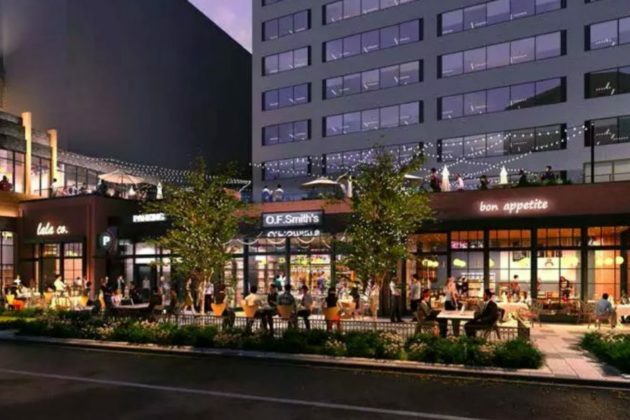 In all, JBG Smith plans to add 84,000 square feet of retail and commercial space along Crystal Drive by renovating some of the existing buildings on the property, and tacking on some additions as well. 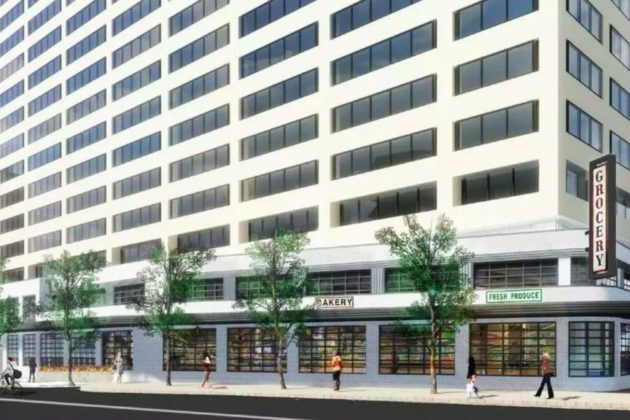 The main draws will be a three-story movie theater, reportedly an Alamo Drafthouse location, and a 15,000-square-foot “small format specialty grocer,” like a Trader Joe’s or Whole Foods. Those businesses, and perhaps many others, will generally be centered closest to Crystal Drive’s intersection with 15th Street S., and the existing one-story retail in the area will likely be demolished to connect the theater and the grocery store, removing a small park in the process. However, cycling advocates worry that all these plans will do little to improve connectivity to the Mt. Vernon Trail, leaving people highly dependent on cars in the area. The Washington Area Bicyclist Association is urging cyclists to press for protected bike lanes along both Crystal Drive and 18th Street S. to create a safer, low-stress place to bike that wouldn’t be constantly blocked by parked cars. JBG Smith declined to comment for this article, but it seems the developer doesn’t see much room for protected bike lanes in the area. 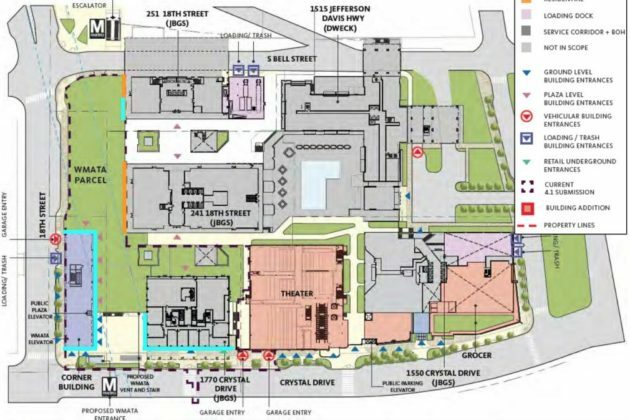 While a bike lane along Crystal Drive is included in the Crystal Square plans, county transportation staff told the Planning Commission back in February that “there is not enough space to provide a protected bike lane” on the road. Eventually, JBG says it could also build a two-story retail building further down the block, at Crystal Drive’s intersection with 18th Street S. That feature has drawn a bit more scrutiny from neighbors, who note that the site was long envisioned as a new park to replace the green space set to be removed in the earlier construction. Fuller points out that the location is also the proposed place for a second Metro station entrance, but with the county putting the brakes on that project as it deals with a funding crunch, she argues it would make much more sense to delay consideration of adding a new building there as well. Otherwise, she sees it as a “poison pill” impacting the whole development proposal. The Planning Commission ultimately voted to endorse that building back in May, though many members expressed grave concerns about the proposal. The Parks and Recreation Commission even said it was “premature” to allow the building until securing firm funding commitments from JBG to ensure a park of some kind is indeed built on the space. Those concerns aside, the Board seems unlikely to take action on that part of the proposal, at least in the near term. JBG is also asking for permission to revert one office building on Crystal Drive back to office space, doing away with plans to convert it into an apartment building, a move fueling speculation that the company wants to wait to see if Amazon tabs the neighborhood for its second headquarters before committing to plans for the building. Staff recommend that the Board defer any consideration of that request, and plans for the two-story building, for up to a year, given all the uncertainty still surrounding the site. The Board will take up consideration of the project at its meeting Saturday (Oct. 20). Progressive Voice: Invisible Barriers: What do you see?